Are you missing two or more teeth? If you have lost back teeth, dental implants provide the strength and stability to let you to eat what you want and preserve your jawbone. 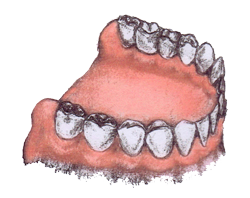 Dentures simply don’t offer the same natural feel, function, or stability. 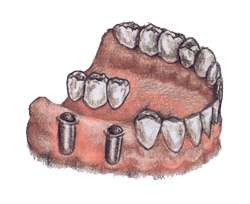 A fixed bridge anchored to dental implants is the only fixed alternative. 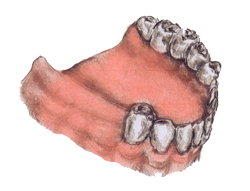 Traditional dentures can’t offer the same stability or function. Examination & x-ray film review of the area where the implant is to be placed. For example, if you have multiple teeth in the back of your mouth are missing, the only real solution is the installation of a fixed bridge, which contains all teeth in one piece – anchored on dental implants. This is normally done in a single office visit. A temporary bridge may be provided to restore the area and allow you to eat and function normally. A four month waiting period is required to allow the implant to integrate with the jawbone. 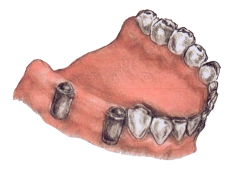 The implants need 1 – 2 months to integrate with the jawbone before the dental bridge is attached. The wait time will vary, depending on the teeth affected and the dental aesthetics. The permanent bridge is fabricated and placed. The new bridge will should feel and work like your natural teeth, providing a stable and permanent solution that gives you the freedom to eat what you want.